Steam enhanced extraction (SEE) is an in situ thermal remediation technology used in relatively permeable settings to heat the ground and remove organic contaminants. SEE can be combined with other thermal methods for treatment of source areas with clay layers, and with less aggressive methods for source and plume restoration (e.g., see Thermal Remediation - Combined Remedies). The principle of SEE is to heat the subsurface aggressively while containing and extracting contaminants. 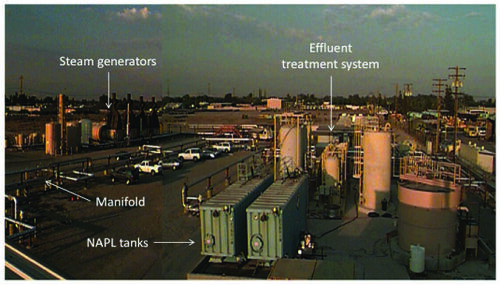 A typical SEE system consists of a steam generator, a thermal well field, and an effluent treatment system (Fig. 1). Figure 1. 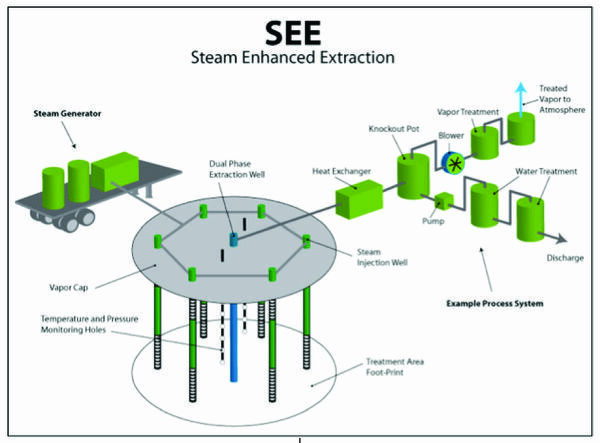 Steam Enhanced Extraction schematic (courtesy of TerraTherm). Displacement as a non-aqueous phase liquid (NAPL) and extraction with the pumped groundwater. Vaporization in the steam zone. Accelerated vaporization and extraction in the vapor phase through pulsed pressurization and depressurization cycles. Dissolution, destruction, and removal with the extracted water. Equipment used for SEE includes a steam generator and an effluent treatment system for cooling, separation, and treatment of the extracted vapors and fluids. Figure 2 shows an example of the equipment used. Figure 2. Example equipment used for SEE implementation. Burning fossil fuels such as natural gas, propane, or diesel typically generates steam. Softened water is vaporized to steam and conveyed to injection wells through manifolds. Valves on each injection well regulate the steam injection pressure. A safe injection pressure of 0.5 psig (pounds per square inch gage) per foot of overburden above the screen is recommended. Extraction wells are dual-phase wells, typically equipped with downhole pumps and vacuum extraction. Liquid entrainment is also used for fluid extraction and can be effective at creating a predetermined drawdown and hydraulic containment. Heating progress is monitored through energy balance calculations and in-ground measurement of temperature, typically using thermocouples or fiberoptic temperature sensors. Automatic data collection provides information on steam movement and heating progress. Steam does not penetrate tight layers easily. Removal of contaminants from lower permeability zones can be accelerated by the use of pressure cycling. Such cycling is induced in the formation after steam has reached the extraction wells, and is conducted by varying steam injection pressures and rates over time, causing pressure variations and temporal boiling events in the subsurface. This enhances volatilization of contaminants from zones immediately outside the steam zone, reducing of contaminant concentrations in these areas. Typical SEE systems operate between 2 and 12 months and use a well spacing between 15 and 100 ft. Deeper sites typically use larger well spacing. SEE is used at sites with significant permeability and/or groundwater flow. The SEE technology allows for high net extraction of fluids and displaces large amounts of groundwater towards the extraction wells. As a result, less water has to be heated to allow the formation to reach target temperatures. In addition, this displacement facilitates hydraulic control of NAPL mobility. The steam sweep through the formation and the accompanying pressure gradient displace the mobile NAPL and vaporized components as an oil front, which is recovered when it reaches the extraction wells. The design of injection and extraction wells and their locations is critical for good SEE results. For hydrocarbons such as heavy oils, SEE is used to reduce viscosity and to displace separate phase oil towards extraction wells. At such sites, complete contaminant removal is not practical. The more volatile fraction of the oil is removed, with the heavier fraction left behind. A benefit of SEE is the ability to conduct pressure cycling to improve contaminant removal rates. After the target zone has been heated and the majority of the NAPL extracted as a liquid, pressure cycling is induced by varying the injection pressure and the applied vacuum. This process has been shown to result in very low concentrations of volatile contaminants in the original source zone. SEE works best in medium to high permeability zones. When combined with in situ thermal desorption (ISTD) or electrical resistance heating (ERH), effective solutions are available for sites with low permeability zones as well. Figure 3. The large SEE system at Visalia Pole yard used to remediate a 2-acre, 140 ft deep creosote source. Alameda Point, CA: A small TCE and oil source zone was remediated in 70 days by SEE. Six peripheral nested injection wells were used to surround the source, and steam pushed towards the central extraction well. Boiling temperatures were reached at all locations, and more than 2,000 lbs of contamination was removed. Soil and groundwater sampling indicated > 99% mass reduction within the target treatment zone. Visalia Pole Yard, CA: A large creosote-contaminated Superfund site was remediated by the use of SEE over a 3-year period. Steam injection wells were 145 ft deep, and a large 400-gpm treatment system was used for the extracted fluids (Fig. 3). More than 1 million lbs of organic contaminants were removed, and eventually the site was delisted, as the compliance wells reached the desired cleanup levels. Beede, NH: SEE was used to treat a waste-oil source zone. Steam was injected into three vertical zones, and fluids extracted and treated. Remedial soil standards were met for all contaminants of concern, including benzene and naphthalene (final report pending). SEE has also been an integral part of several sites where ISTD and steam were used in combination. SEE is a thermal technology well suited for medium to high permeability source zones. Contaminants are removed by displacement (in NAPL and dissolved form) and by vaporization. When combined with ISTD or ERH, complex sites with high and low permeability zones can be effectively remediated. ^ Udell, K., Heron, G., McDonald, M., and Mabey, W., 2000. 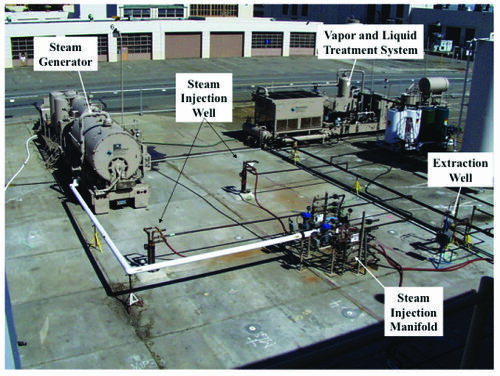 Steam enhanced extraction demonstration at site 5, Alameda Point. Field Feasibility Demonstration for the US Navy, DO-9. Final Report. Berkeley Environmental Restoration Center, University of California at Berkeley, Berkeley, CA.